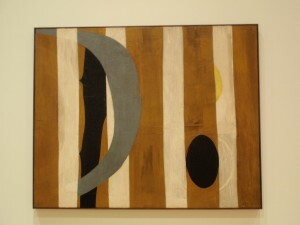 Motherwell decided to become a serious artist only in 1941. Although he was especially influenced by the Surrealist artists; Max Ernst, Yves Tanguy, and André Masson; he remained largely self-taught. 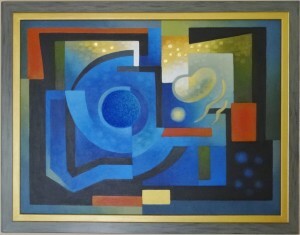 His early work followed no single style but already contained motifs from which much of his later art grew. He received his first one-man show in 1944 at Peggy Guggenheim’s Art of this Century Gallery in New York City. In the mid-1940s Motherwell painted abstract figurative works that showed the influence of Surrealism. But in 1949 he painted the first in a series of works collectively entitled “Elegy to the Spanish Republic.” He painted almost 150 versions of these “Elegies” in the next three decades. These Abstract Expressionist paintings show his continuous development of a limited repertory of simple, serene, and massive forms that are applied in black paint to the picture plane in such a way that they generate a sense of slow, solemnly suggestive movement. During the 1960s he painted in several different styles, so that such paintings as Africa (1964, 65; Baltimore Museum of Art) look like enlarged details of elegant calligraphy, while Indian Summer, #2 (1962, 64) combines the bravura brush-work typical of Abstract Expressionism with the broad areas of evenly applied color characteristic of the then-emerging Color Field Painting style. By the end of the decade, paintings in his Open series (1967, 69), he had abandoned Abstract Expressionism in favor of the new style.